Friedrich PTAC Units provide commercial property owners superior guest room temperature control by focusing on three main components. Quiet Operation, Energy Efficiency, and Durability are top priorities when designing and manufacturing all Friedrich commercial PTAC unit products. Friedrich has become a household name in commercial air conditioning equipment, and they continue to improve RevPAR for hotels, motels, hospitals, assisted living communities, colleges, universities, and more with their reliable PTAC units. Every Friedrich Commercial PTAC Air Conditioner Unit carries an impressive list of protective durability features. that undergo an 11-step preparation process, are powder coated with a polyester finish, and are cured in an oven for exceptional durability. alerts maintenance to component failures or operating problems. 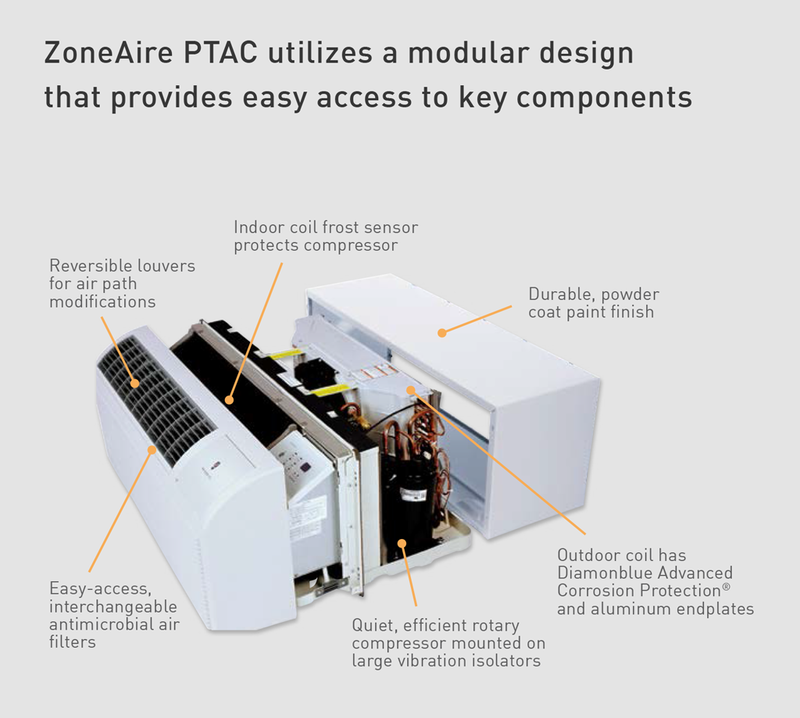 simplify maintenance and extend the life of each individual PTAC unit. initiates heat if the temperature falls to 40°F in an unoccupied guest room. protects electrical systems from overload when power is restored. maintains the integrity of your PTAC units. comes standard on all Friedrich commercial PTAC units to protect against harsh coastal environments. Friedrich PTAC Units are built to protect the health and comfort of your brand, property, and guests. The features listed below will manage the temperature and moisture within your guest rooms, and prevent extreme climate conditions that could cost you both money and customers. Just one bad review about a freezing, boiling, or moldy room can take lots of time and work to correct. 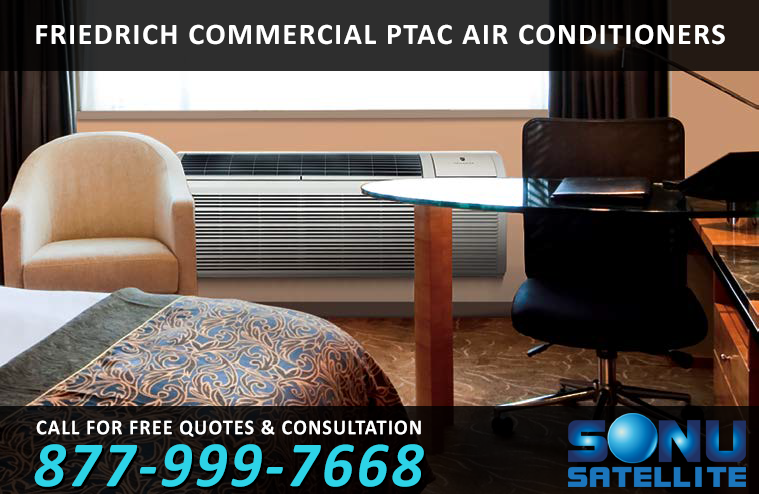 Choose Friedrich commercial PTAC air conditioners for these expertly engineered safeguards. removes up to 3.0 pints/hour of moisture in cool mode to improve comfort and reduce the chance of mold and mildew growth. brings in fresh outside air when desired. are user friendly with easy-to-read LED display that can show either set-point or actual room temperature as selected by owner. are easy to access and washable. quickly heats a room to the desired temperature for increased comfort. checks room temperature and automatically adds heat boost if necessary. every nine minutes to ensure desired conditions are maintained. to easily change direction of airflow. Friedrich incorporates some of the industry’s best sound reduction technology into all of their PTAC Unit models, so your guests can sleep as soundly as possible. Whether your guest rooms house vacationers, traveling business people, medical patients, elderly residents, or students, a rattling air conditioner will absolutely result in poor reviews and additional work for your property’s staff. Provide the peaceful feeling of quiet climate control to every guest and patient staying at your property. for added durability and reduced sound levels indoors. to keep the compressor running smoothly and quietly. to effectively block outdoor noise. to create a wide-path air flow that reaches the furthest corner of the guest room more quietly than conventional fans. Friedrich PTAC Units are built for commercial efficiency, as well as guest room comfort. No hospitality appliance would be considered valuable today, if it didn’t also help reduce your business’ energy consumption. Friedrich commercial air conditioners are fitted with a number of advancements to both cut electrical costs and provide your staff with additional control. with EERs up to 12.0 and COP up to 3.55.
available in our complete line. ensures more run time in efficient heat pump mode. to adjust low/high temperature range limits for reduced energy usage. in condensate removal system cools the coil and increases efficiency. ready to allow hotel owners to control units from a central location.